Figure 1. View southeast from Overlook Cabin looking over the VTTS. 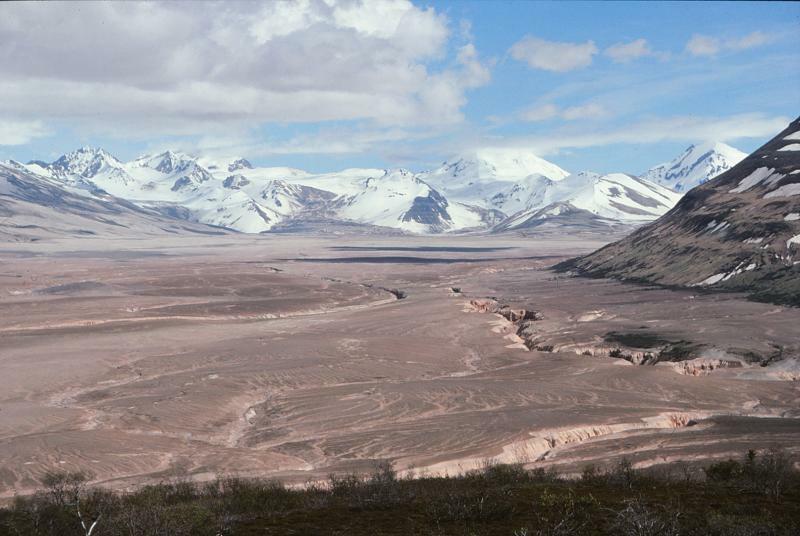 The pyroclastic and ash deposits that fill the valley remain nearly vegetation-free more than 100 years after the 1912 Novarupta-Katmai eruption. Photograph by Game McGimsey, AVO/USGS, June 10, 1991. Volcanic ash isn't only a hazard during an eruptive event - in strong winds, loose ash can be picked up and reworked into dust clouds. Resuspension and transport of fine-grained volcanic ash from the Katmai National Park and Preserve region of Alaska has been observed and documented over the past several decades and has likely been occurring ever since the 1912 Novarupta-Katmai eruption. This eruption produced approximately 4 cubic miles (17 cubic kilometers) of ash deposits and 2.6 cubic miles (11 cubic kilometers) of pyroclastic material that filled nearby valleys, creating what is today known as the Valley of Ten Thousand Smokes. Ash in this valley is up to 660 feet (200 meters) thick and the valley remains almost entirely free of vegetation (fig. 1). During the spring and fall, or whenever strong northwesterly winds blow over the snow-free landscape, the ash can be picked up (reworked) into dust clouds. The ash is especially susceptible to reworking when the ground is very dry. These dust clouds have been observed visually by individuals downwind and also in satellite imagery (figs. 2 and 3). These dust clouds are concentrated between 4,000 and 11,000 feet (1-3.4 kilometers) above sea level and can extend up to 155 miles (250 kilometers) over Shelikof Strait, parts of Kodiak Island, and over the Gulf of Alaska. 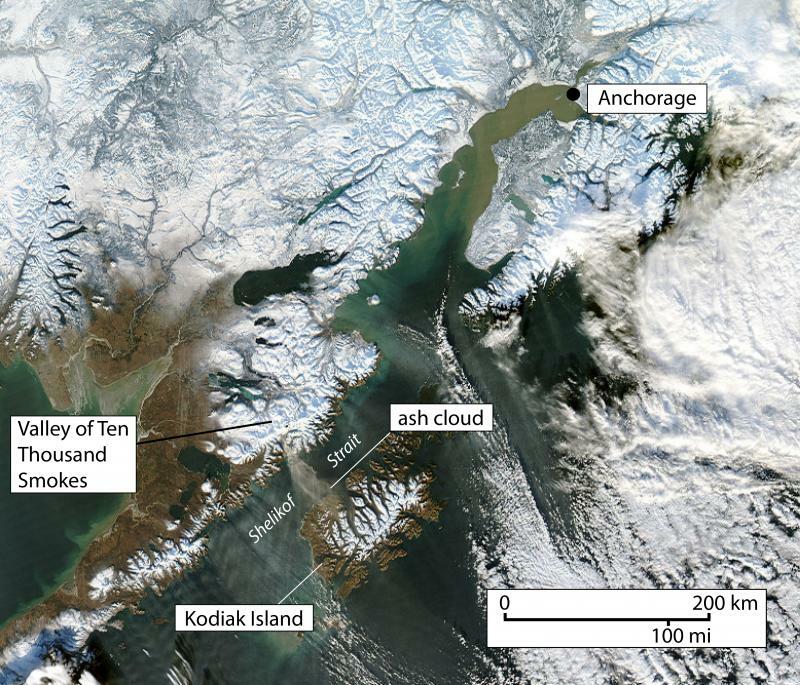 Trace amounts of ash fallout (typically less than 1/32 inch or 1 mm) have been reported on communities on Kodiak Island. Samples show this fallout is primarily composed of volcanic ash. Figure 2. MODIS Aqua 1-km resolution true color satellite image shows a resuspended ash cloud generated from high winds scouring the dry, unvegetated deposits in the VTTS. Image obtained November 29, 2010, courtesy of NASA. What are the hazards associated with resuspended ash? Clouds of resuspended volcanic ash have not been well studied and little is currently known about the amount or sizes of ash particles in the clouds. Like many other wind-related erosion events in Alaska, strong winds are able to pick up fine material, in this case volcanic ash rather than silt or sand. The clouds are composed of volcanic ash, which is primarily volcanic glass, and they appear similar to ash clouds from a volcanic eruption. As resuspended ash is physically identical to ash produced in volcanic eruptions, even dilute clouds can pose hazards to human health and aircraft operation. The impact of fallout of resuspended ash is not well known and the largest resuspension events observed so far only produced fallout in trace amounts (less than 1/32 inch or 1 mm). It is not known if this amount presents an air quality issue and thus a public health hazard. The ash does create a hazard to aircraft flying at those elevations. The Alaska Volcano Observatory works closely with the National Weather Service, who has the responsibility to issue forecasts and statements of resuspended volcanic ash More information on volcanic ash is found at: http://volcanoes.usgs.gov/ash/. Figure 3. 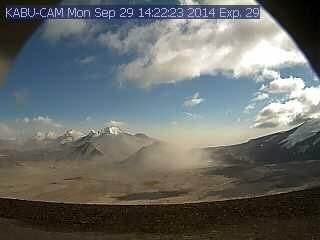 Web camera image shows resuspended ash from the Katmai region on September 29, 2014. These dust clouds are not caused by an active volcanic eruption. These volcanic ash clouds are the result of high winds picking up loose volcanic ash from extensive deposits erupted over 100 years ago from the Novarupta vent on the Alaska Peninsula within Katmai National Park. They can occur regularly in the spring and fall, or whenever strong northwesterly winds blow across the area coincident with extended periods of dry ground surface conditions. Cloud heights have been estimated between 4,000 and 11,000 feet (1 - 3.4 kilometers) above sea level. Clouds can extend up to about 155 miles (250 kilometers) over Shelikof Strait, parts of Kodiak Island and over the Gulf of Alaska.